Here is a plateful of pure delight! 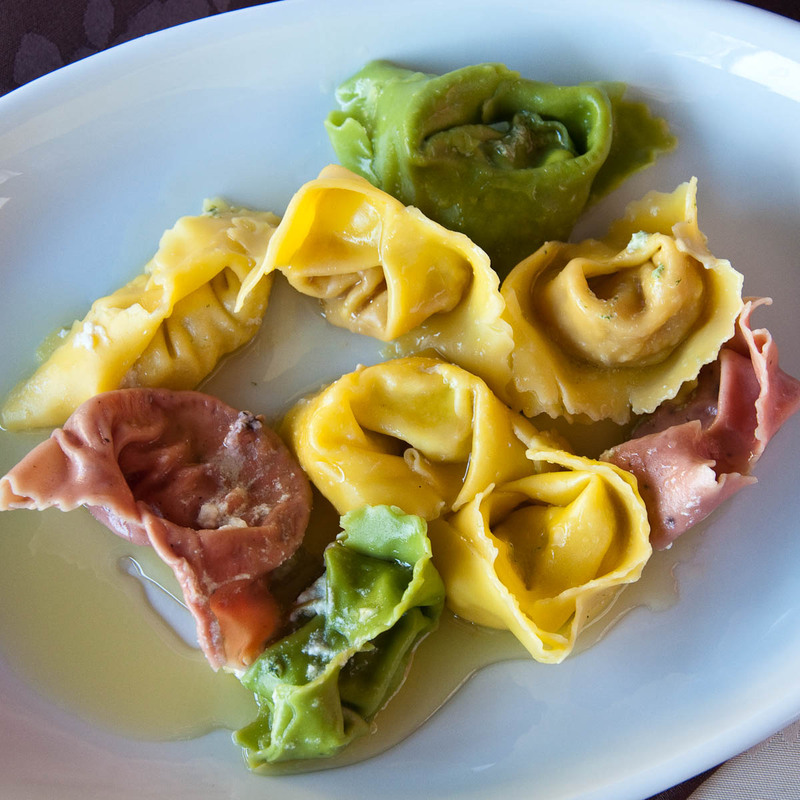 These are the famous tortellini (or tortelli as they are locally known) of Valeggio sul Mincio. 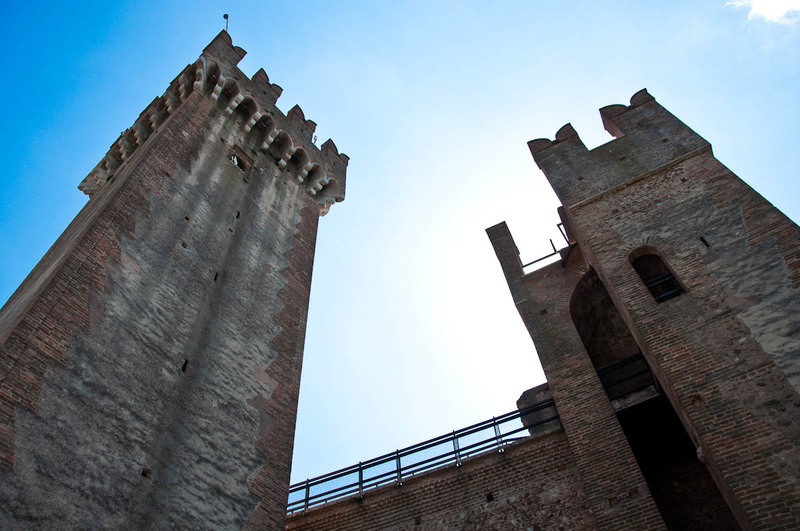 Mincio is a wide and impetuous river which begins from Italy’s biggest lake – Garda – and then runs fast and furious all the way to the river Po about 75 km away. 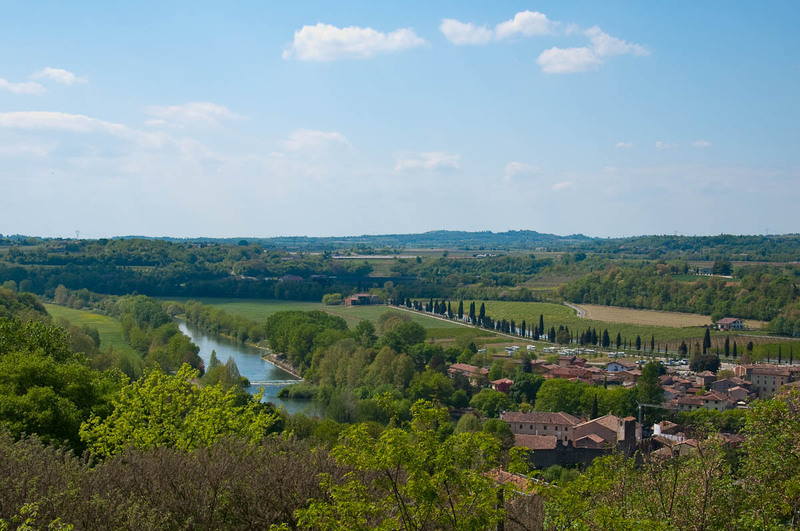 Valeggio is a picturesque town on the shores of Mincio with medieval fortifications, ruined castle and one of the most beautiful parks in Italy – the expansive Parco Giardino Sigurta. The real claim to fame of Valeggio though is as the birthplace of tortellini. You know those cute little pasta wraps stuffed with morsels of tasty fillings – anything from prosciutto through porcini mushrooms to spinach and ricotta. Whilst still living in England, I would buy tortellini often from the fresh pasta section of any British supermarket. They made for a quick and tasty dinner, one of those meals which only took five minutes to prepare (time being always scant in my breathless London life) and yet gave the illusion of homemade food. So, since moving to Italy a year and a half ago, I have taken any opportunity to eat tortellini, this being the land where they had been created after all. Little did I know that the actual place of their glorious culinary birth is only about an hour away from Vicenza – the Northern Italian city where we currently live. 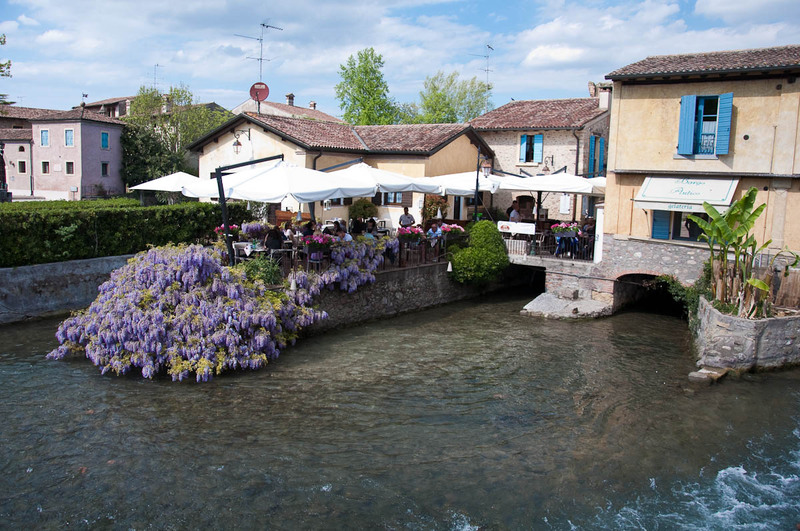 A lucky chance about a month ago took us to the beautiful Borghetto sul Mincio (one of Valeggio’s boroughs) of which I told you in a previous blog post. We only had a limited time there and I used it to snap as many pictures as I could, to cross the wooden bridge over Mincio which apparently on 30th May 1796 had been crossed by Napoleon himself, and just to drink in the beauty of the place as much as I could. I didn’t fail to notice the large number of restaurants and eateries though and I wondered if it were just the splendid location that attracted people to them or if there was another reason for the popularity of the place. 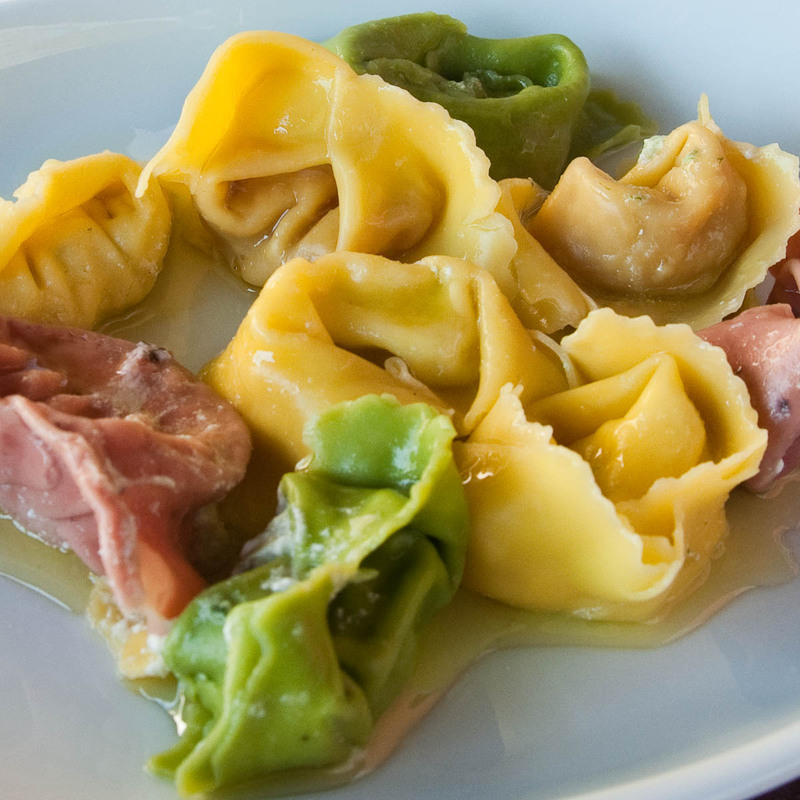 A quick search online that evening told me all I needed to know: the tortellini were born there in the 13th century and since then people have been flocking to the place to indulge in them. Locally called ‘Nodo d’Amore‘ (Love Knot) a local legend of undying love between a beautiful nymph and her human lover is credited as the inspiration for the creation of the tortellini. And we did. It was a splendid Saturday morning with the sun shining bright and the wisterias in full bloom. After an eventful drive up from Vicenza (yes, we took the wrong turn and ended on our way to Bologna with no exit from the highway for miles), we pulled onto the splendid Ponte Visconteo – the 650 m long bridge which has been straddling the river Mincio since the 14th century. 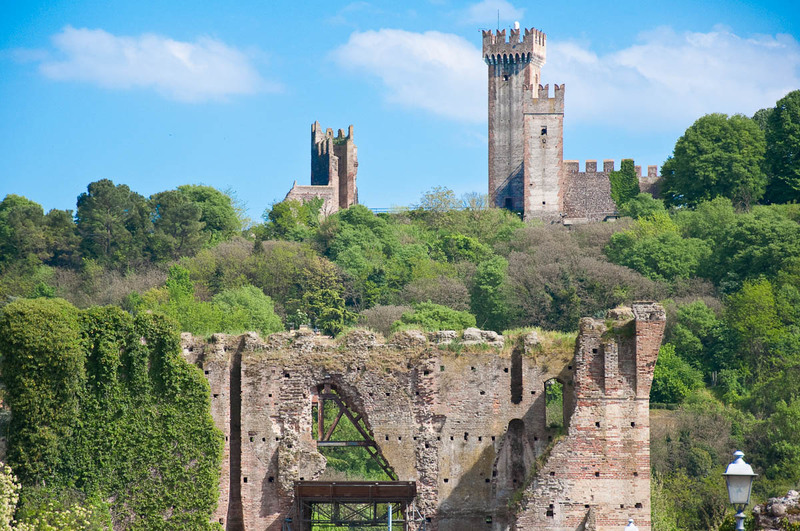 … and the mighty ruins of the Scaligeri castle up on top of the hill. 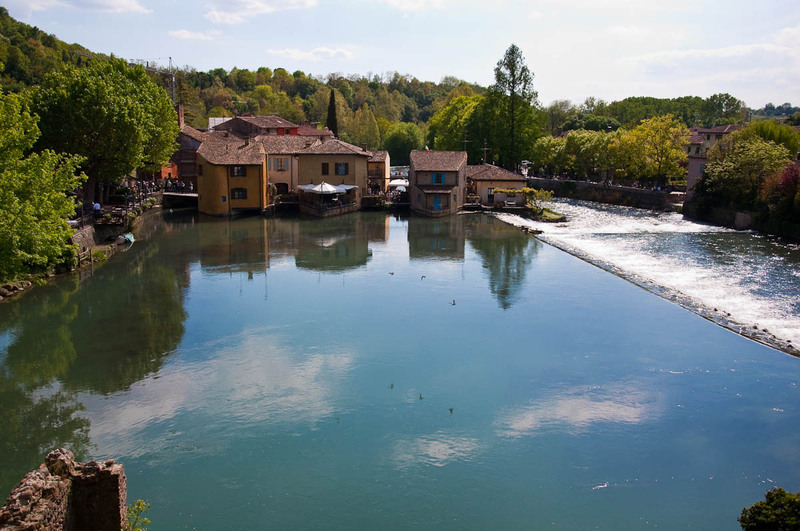 Borghetto was teeming with locals and tourists in a nice way. Everyone seemed relaxed and unrushed. There was no stress, no pushing, no long queues, which are so typical of the overexposed places every travel guide tells us to go to. A fisherman in waders stood in the middle of the wide river stalking the fish, competing for his catch with graceful swans, waddling ducks and even a heron. It was idyllic, but it was also lunchtime and the call of the tortellini was all I could think about. With so many restaurants around, it was difficult to know which one to choose, so we simply walked in the first eaterie which seemed to have enough free places for our group which happened to be Caffe Visconti. We were ushered through the restaurant and found ourselves on a long and thin terrace right on the water and with a splendid view towards the wooden bridge and the nearby eateries. Menus were distributed and my immediate concern was to find the page with the tortellini dishes. There were quite a few, but the best bit was that you could order a plate of mixed tortellini for 12 euros giving you a chance to sample about five different fillings. Now, the traditional filling of Valeggio’s tortellini is a mixture of beef, pork, chicken, onions, carrots, celery, rosemary, Bardolino wine and breadcrumbs, all cooked together and then ground into a soft mixture. The other fillings on offer sounded really exciting, too. For example: radicchio and gorgonzola, as well as pumpkin with butter and sage. Unfortunately, the restaurant had run out of the filling which we all thought sounded divine: sea bass. The tortellini arrived quickly enough and were truly one of a kind. For example, I have never been a big fan of radicchio and I avoid gorgonzola at all cost, but the tortellino stuffed with a mixture of the two was a revelation. All the little parcels on the plate were full of flavour, the pasta was tender and revealed perfect combinations of surprising tastes with each greedy bite. 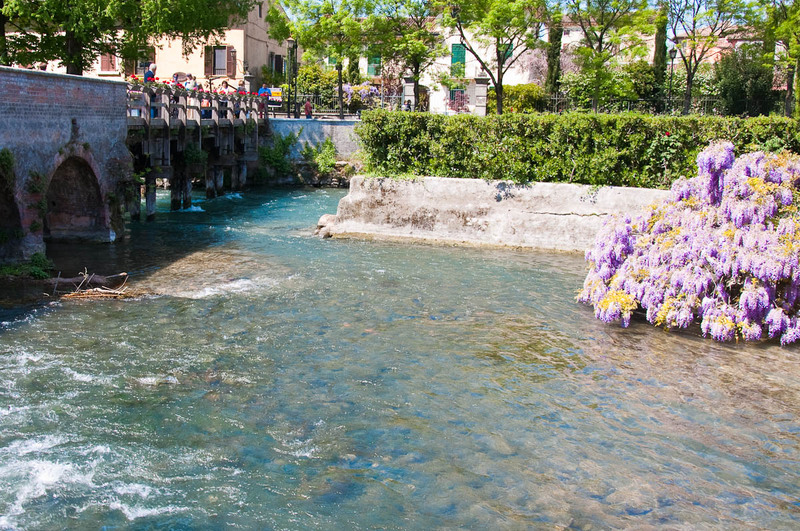 With the crystal clear waters of the river rushing past, the fragrance of the wisterias wafting over and the good food in front of us, it was one of those precious moments when the world is just right. We spent quite a long time on the terrace, talking and watching the fish dart by the foundations of the old water mills. The service was a bit haphazard and it took a long stretch of time to get somebody’s attention to order dessert. The location though was truly outstanding. In the end, we didn’t realise that we had to go to the bar to settle the bill and as no-one rushed us out, we just stood there for a long time chatting away. 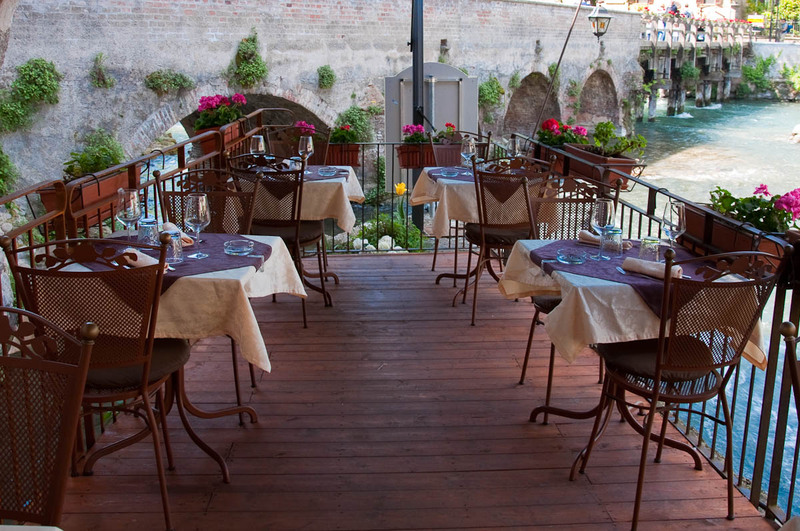 Apparently, Borghetto is haunted at full moons, so we asked our waitress about it. She confirmed it was, but when we tried to delve in deeper, she went a bit shtum and then half-serious, half-joking told us that, yes, it is haunted by kids playing football, so I am not entirely sure if she was talking in jest or not. After lunch we worked the tortellini out with a quick walk to the top of the hill, where from the grounds of the ruined castle a splendid view over Mincio and the adjoining area is revealed. As I was taking it all in, I remembered the legend about the nymph Silvia who gave her beloved Malco her handkerchief tied in a knot as a sign of her undying love. A knot which nowadays is replicated by every exquisite locally handmade tortellino. It was all just perfect – the food, the landscape, the history and the myth. So, if you are looking for a dish where flavour, tradition and fable come together as one, you should put Vallegio sul Mincio a top of your wish list.